A village with a unique history, bordering the 130 km long Wadden dyke. It is a village surrounded by beautiful scenery with many qualities. To boost the liveliness of the village, a number of residents started to research the possibilities for the development of new recreational facilities. On the 24th of November 2016 the initiators organised a “Schetsschuit” to explore how these goals can take shape. This resulted in an energetic brainstorm with over 20 participants, stakeholders and residents from the region. 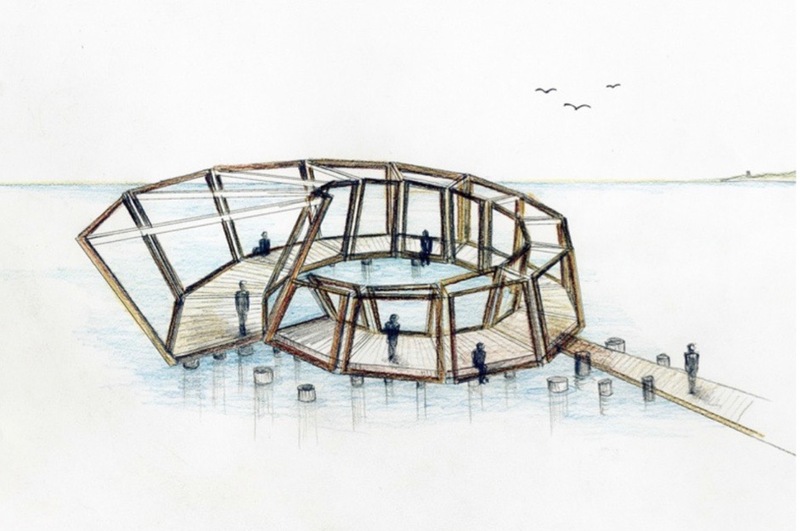 All ideas were examined to be able to explore the possibilities and restrictions. The ‘Wierumer Aak’, the ‘Frisian tide clock’ and the sea wall near Wierum are the inspiration for the tide pool in Wierum. 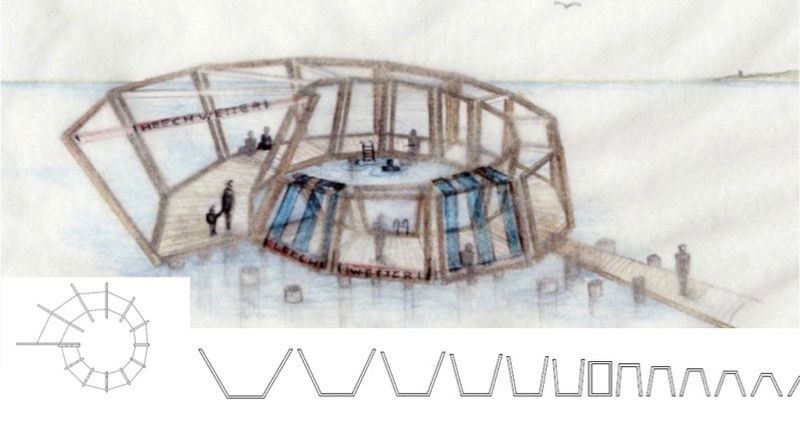 The coiled Nautilus shape, an almost Escher -like drawing of how the turned V- shape of a dike transforms in the V-shape of the barge. The fence creates windows (and window sills) to view the surrounding landscape. The infinity of the Dutch Shallows on the one side and the powerful line of the Frisian See dike with the church tower of Wierum on the other side. 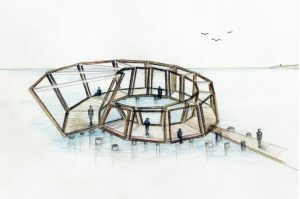 A pavilion, build outside the dike, and connected to the existing dike body. A shell, meaning it can be used for many different activities and adjusted/ completed with temporary installations, for example to provide protection against wind and sun. At high tide the water will rise to just below the floor. The pavilion can also still be reached at low tide. 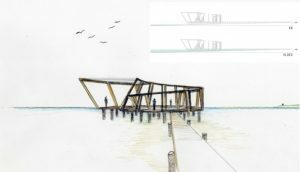 The difference in altitude in the pavilion also reflects the difference in altitude between low tide and high tide. (approx. 2 to 2,5 metres). The tide pool is part of a total plan, which is being developed. 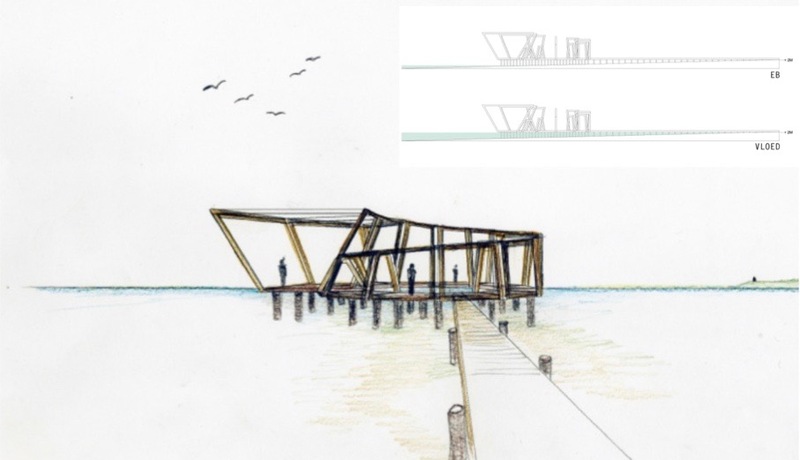 A pier, beach and salt marsh are also included in the final design. For more information: dorpwierum and maatschap Observatorium responsible for the great design!